Guinea pigs are one of the most popular small house pets and for good reason! Cute and communicative, they can form close bonds with their owners. However, owning a guinea pig means making the commitment to provide it a good life. 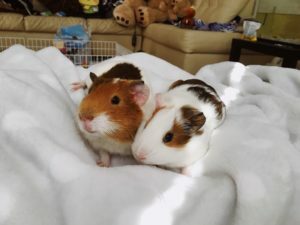 There are many misconceptions about what guinea pigs need to live a healthy life and this article is here to debunk them! Guinea pig are social animals—a pair of guinea pigs is better than just one. In the wild, guinea pigs travel in large herds. Many people do not know this or think their pig will be fine on its own. However, without a friend, most guinea pigs will become depressed, which can develop into physical issues as well. Living in groups decreases levels of aggression and stress in guinea pigs. They also get the physical exercise they need by playing and chasing each other around. Overall, social activity among pigs increases their health and longevity. When adopting multiple pigs, it is best to adopt the same gender. For boars (males), it is recommended to house them in pairs. However, since soes (females) have greater social adaptability and weaker hierarchy structures, they can be kept in larger groups. Most cages sold in pet stores are not large enough for guinea pigs to live a happy and healthy life. The minimum cage size for a pair of guinea pigs is 10.5 square feet and this number increases with the number of pigs owned. Even a single pig requires at least 7.5 square feet. This is so they have plenty of room to explore and play around in. Just because they are small animals does not mean they do not need space just like a cat or dog would. In their cage, proper bedding should cover the bottom. In addition to bedding, the cage should contain some boxes and tunnels that they can hide under and feel safe. Guinea pigs, just like humans, do not produce Vitamin C on their own! Because of this, their diet must supplement it for them. Dark, leafy greens like kale and fruits like oranges are great sources of Vitamin C. Other foods include red peppers, parsley, and broccoli. Be careful when feeding them fruit, however, since fruit is high in sugar and they should be limited to a few small pieces a day to prevent developing diseases in the long run. It is essential that guinea pigs get a sufficient amount of Vitamin C, as it has been shown to decrease protein oxidative damage, reduce hearing loss, and help maintain a healthy liver. Although labeled as a rodent, research has shown that the guinea pig is in fact not and never has been a rodent! Previous studies of rodents were based on more limited comparisons of certain genes or proteins. However, in a recent study, the guinea pig’s genetic pattern was compared not only to rodents, such as mice and rats, but also other mammals, such as humans, chimpanzees, and opossums. Through some complex statistical computations, the scientists constructed phylogenetic “trees”. These trees linked animals that were genetically most closely related. Their calculations revealed that while rats and mice are close cousins, guinea pigs fall on a distant branch and deserve their own order. When it comes to DNA, guinea pigs are clearly not rodents. Katie is a 3rd year Computer Science major at Georgia Tech. In addition to coding, she is very passionate about advocating for mental health and educating people about the psychology behind it.